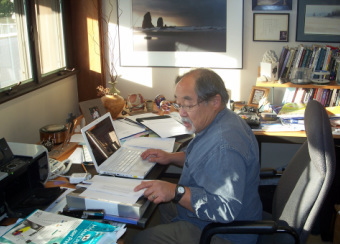 Iwa’s early focus was on identifying its target audience, developing the organization, and discovering culturally significant and biblically sound insights which had strategic importance for ministry to Japanese, Japanese Americans and Asian Americans. The insights which the Lord revealed were chronicled in the kaki seed, a quarterly journal. 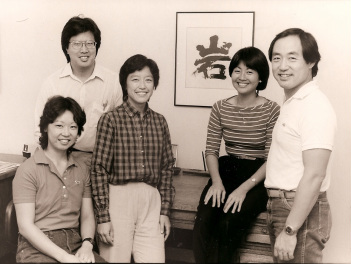 In the early to mid-’80s, Iwa developed consulting relationships with national ministries and denominations such as InterVarsity Christian Fellowship (IVCF) in Madison, WI, and the American Baptist Church in Valley Forge, PA. 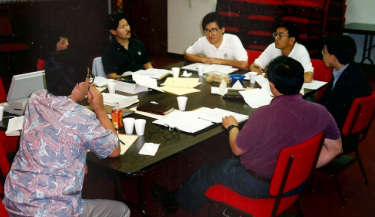 In the mid- to late ‘80s Iwa focused on consulting relationships with Christian leaders and churches, mainly in Southern California. One church, Evergreen Baptist in L.A., used much of what Iwa developed for them, grew to a church with an attendance of over 1,000, and became a model and case study for future Asian American ministries. In 1992, Iwa held its first national conference, Coloring Beyond the Lines, which was reported on in Christianity Today. 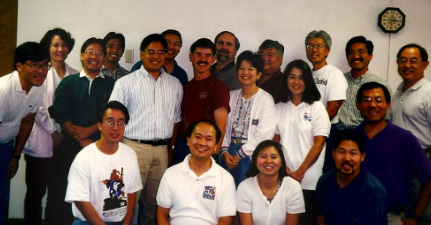 In 1993, Iwa developed a national Board of Directors with new members from New York, Seattle, and the San Francisco Bay Area. One of the programmatic shifts which this Board decided to make was to move away from consulting for churches and denominations, and toward sharing the accumulated wisdom of Iwa through workshops which presented Iwa insights to people in the pews. 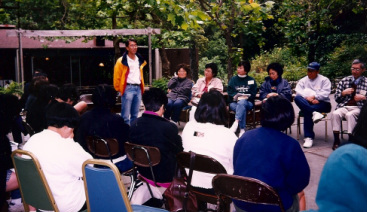 For about 10 years, from 1992 onward, Iwa served as a consultant for Christian Layman Church, one of the largest, fastest growing Asian American churches in the San Francisco Bay Area. 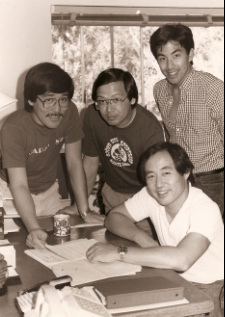 Through Iwa’s networking of various Christian churches and groups with a burden for reaching people of Japanese ancestry in the Portland area in 1994, a new organization called Nichibei Christian Fellowship was formed. At the same time, Iwa helped four families there plant a new Japanese American church, Morning Star Bible. 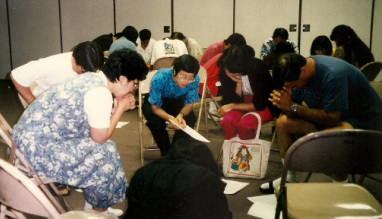 In 1996, Iwa initiated a program of prayer gatherings at which Christians from various churches came together every few months to pray that the Lord would bring about a spiritual renewal that would result in the reaching of the 97% of Japanese Americans and other Asian Americans who don’t yet know Christ. In 1997, new possibilities opened up with Iwa’s move to a new, larger office, the hiring of a new Executive Director, and the expansion of the National Board to 20 members. New resources began to be created, new networking and speaking opportunities were taken, and the use of electronic media to disseminate Iwa resources was revived. In the new millennium, Iwa has been trying to put its resources literally into the hands of the people in the pews who could use them. So Iwa created new faith-sharing tools and other resources for personal evangelism, self-published a seven-unit reference book for leaders ministering to Asian Americans called Foundations for Asian American Ministry, developed networks of emerging leaders and Bay Area leaders, and conducted evangelism training for various churches and groups. For the past several years, Iwa has been developing The God Man Series to introduce Japanese- and Asian Americans to Christ in a culturally sensitive way that will reach deep into their hearts. The series will be an important key for helping Japanese- and Asian American churches experience spiritual renewal, as well as an effective means for leading unchurched Asian Americans into a committed relationship with Christ. Iwa has successfully piloted the first unit of the series--Meeting Jesus for the First Time: What Does Jesus Do?—at Valley Springs Presbyterian Church in Roseville, CA, and has since, successfully piloted it with small groups in various Asian American churches. It is currently being re-formatted so that it so that it can be ordered as a book. Iwa hopes that as the series proves to be effective, it will spread throughout the Japanese- and Asian American church community, and beyond.